Oncorhynchus mykiss (rainbow trout) are one of the most widely introduced fish species in the world. Native to western North America, from Alaska to the Baja Peninsula, Oncorhynchus mykiss have been introduced to numerous countries for sport and commercial aquaculture. Oncorhynchus mykiss is highly valued as a sportfish, with regular stocking occurring in many locations where wild populations cannot support the pressure from anglers. Concerns have been raised about the effects of introduced trout in some areas, as they may affect native fish and invertebrates through predation and competition. Rainbow trout are a deep-bodied, compressed species of fish, with extremely large sea-run individuals growing to 1220mm and 16.3kg. The general body shape is typical for a trout, with a moderately large head and a mouth that extends back behind the eyes. Rainbow trout have highly variable colouration. Rainbow trout that live in lakes have a very silvery appearance, usually with a dark olive-green colour on the back. Occasionally the back is a deep steely blue, mostly in Rainbow trout that live well offshore in deep lakes or in small fish that have not yet spawned. Numerous spots are present on the back and extend about two-thirds of the way to the lateral line down the sides. The sides are silvery and largely free of spots, while the belly and ventral surface of the head are whitish. Eyes are an olive to bronze colour. Sometimes a soft, metallic-pink colour is present along the sides of the body and the head. Lake fish usually spawn in lake tributaries, where the young trout feed and grow before migrating downstream after about a year. Growing to maturity in the lake takes around 2 to 4 years, at which time they migrate back to the tributaries to spawn. Most fish will return to the tributary in which they hatched (McDowall, 1990). Rainbow trout are highly valued as both a sport and table fish. They are the basis of many sport fisheries and are highly sought-after by anglers. In many locations rainbow trout are raised in hatcheries, then liberated into rivers and streams for recreational anglers to catch. They have also been introduced to many countries as an aquaculture species for commercial purposes (FishBase, 2003). Well-oxygenated, clean fresh water, with a temperature of around 12°C is preferred, although a range from 10°C to 24°C is tolerated (FishBase, 2003). Rainbow trout tend to thrive better in lakes than in streams or rivers, although large fish are often present in remote headwaters (McDowall, 1990). Sexual. Fertilisation is external, with the female trout excavating a hollow in streambed gravel for the eggs to be laid in. Between 700 and 4000 oarnge-red eggs are laid per spawning event. The male then fertilises the eggs and they are covered with a layer of gravel. This 'nest' is known as a redd (McDowall, 1990; FishBase, 2003). Adult rainbow trout eat insects (both aquatic and terrestrial), crustaceans, molluscs, fish eggs, and small fish. Young trout feed predominantly on zooplankton (Cadwallader & Backhouse, 1983 in Fishbase, 2003). Introduced to many locations as an aquaculture species.Introduced to many locations to 'improve' the native fish fauna for anglers. Recommended citation: Global Invasive Species Database (2019) Species profile: Oncorhynchus mykiss. Downloaded from http://www.iucngisd.org/gisd/species.php?sc=103 on 22-04-2019. Impacts include hybridisation, disease transmission, predation and competition with native species. 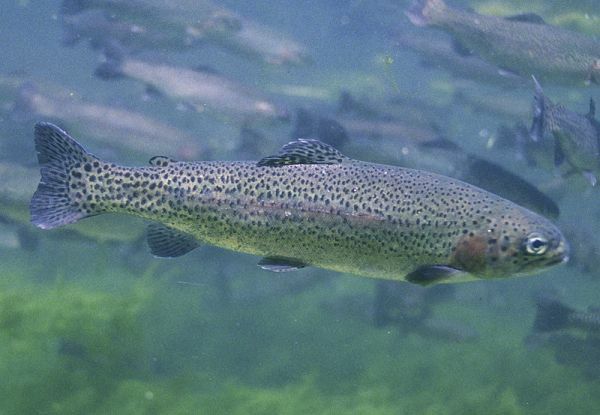 In the United States, the introduction of rainbow trout into areas outside of their native range has caused problems due to their ability to hybridise with native salmonid species, affecting their genetic integrity. Some species, such as the Alvord cutthroat (Oncorhynchus clarki subsp1.) have become virtually extinct because of this. 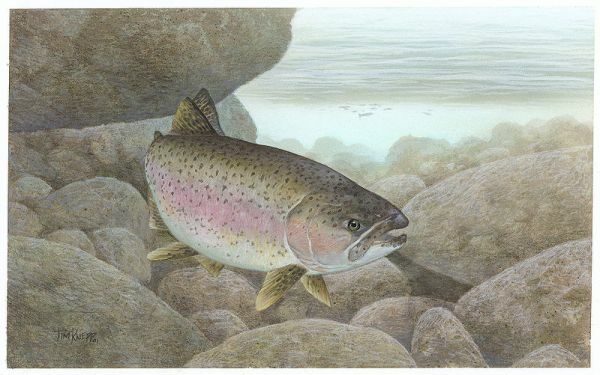 Other species known to be affected by hybridisation include the Lahontan cutthroat trout (O. clarki henshawi); golden trout (O. aquabonita); redband trout (O. mykiss subsp. ); Gila trout (see O. gilae in IUCN Red List of threatened Species) and Arizona trout (see O. apache in IUCN Red List of Threatened Species) (Fuller, 2000). Whirling disease is a condition caused by a protozoan (Myxobolus cerebralis) that causes dysfunction in the nervous system of salmonids, and may result in curvature of the vertebral column. This results in fish losing the ability to maintain a proper orientation, causing them to swim in a spiral motion (McDowall, 1990). The stocking of hatchery-reared trout into the wild has caused outbreaks of this disease in the United States, threatening wild fish populations (Fuller, 2000). In many countries introduced rainbow trout have been reported to have negative effects on native fish, amphibians and invertebrates. In New Zealand it is suspected that rainbow trout affect native fish species through direct predation and competition for feeding areas (McDowall, 1990), while in the United States there is evidence that the same is happening to fish such as the humpback chub (see Gila cypha in IUCN Red List of Threatened Species), suckers, and squawfish (Fuller, 2000). Preventative measures: The use of potentially invasive alien species for aquaculture and their accidental release/or escape can have negative impacts on native biodiversity and ecosystems. Hewitt et al, (2006) Alien Species in Aquaculture: Considerations for responsible use aims to first provide decision makers and managers with information on the existing international and regional regulations that address the use of alien species in aquaculture, either directly or indirectly; and three examples of national responses to this issue (Australia, New Zealand and Chile). The publication also provides recommendations for a ‘simple’ set of guidelines and principles for developing countries that can be applied at a regional or domestic level for the responsible management of Alien Species use in aquaculture development. These guidelines focus primarily on marine systems, however may equally be applied to freshwater. Copp et al, (2005) Risk identification and assessment of non-native freshwater fishes presents a conceptual risk assessment approach for freshwater fish species that addresses the first two elements (hazard identification, hazard assessment) of the UK environmental risk strategy. The paper presents a few worked examples of assessments on species to facilitate discussion. The electronic Decision-support tools- Invasive-species identification tool kits that includes a freshwater and marine fish invasives scoring kit are made available on the Cefas (Centre for Environment, Fisheries & Aquaculture Science) page for free download (subject to Crown Copyright (2007-2008)). Chemical: Antimycin, an antibiotic, is used to kill rainbow trout in the Great Smoky Mountains National Park in the US, in an effort to protect native brook trout (ESPN, 2003). Informations on Oncorhynchus mykiss has been recorded for the following locations. Click on the name for additional informations. Copp, G.H., Garthwaite, R. and Gozlan, R.E., 2005. Risk identification and assessment of non-native freshwater fishes: concepts and perspectives on protocols for the UK. Sci. Ser. Tech Rep., Cefas Lowestoft, 129: 32pp. Summary: The discussion paper presents a conceptual risk assessment approach for freshwater fish species that addresses the first two elements (hazard identification, hazard assessment) of the UK environmental risk strategy The paper presents a few worked examples of assessments on species to facilitate discussion. Summary: A news article on the planned extermination of rainbow trout from a stream in Great Smoky Mountains National Park in the US. Rowe, D.K and Graynoth, E, 2002. Lake Managers Handbook- Fish in New Zealand Lakes. Ministry for the Environment, Wellington. CONABIO. 2008. Sistema de informaci�n sobre especies invasoras en M�xico. Especies invasoras - Peces. Comisi�n Nacional para el Conocimiento y Uso de la Biodiversidad. Fecha de acceso. Fuller, P. 2000. Nonindigenous fishes - Oncorhynchus mykiss. Nonindigenous Exotic Species website, US Geological Survey. Summary: Contains useful information on the distribution and effects of rainbow trout within the United States. Hasegawa, K. and Maekawa, K. 2006. The Effects of Introduced Salmonids on Two Native Stream-dwelling Salmonids Through Interspecific Competition, Journal of Fish Biology 68: 1123 - 1132. Keith, P. 2002. Freshwater fish and decapod crustacean populations on Reunion island, with an assessment of species introductions. Bull. Fr. P�che Piscic., 364, 97-107. Summary: Cet article propose un bilan de la connaissance des esp�ces de poissons et des crustac�s d�capodes pr�sents dans les eaux douces de La R�union avec une synth�se des esp�ces introduites. Keith, P. 2002. Revue des introductions de poissons et de crustac�s d�capodes d eau douce en Polyn�sie fran�aise. Bull. Fr. P�che Piscic, 364, 147-160. Summary: Cet article fait le bilan des introductions d esp�ces dul�aquicoles en Polyn�sie fran�aise. Keith, P. 2005. Revue des introductions de poissons et de crustac�s d�capodes d eau douce en Nouvelle-Cal�donie. Revue d Ecologie (La Terre et la vie), 60, 45-55. Summary: Cet article propose un bilan complet et actualis� des introductions d esp�ces de poissons et de crustac�s d�capodes dans les eaux douces de Nouvelle-Cal�donie. Summary: Synth�se des introductions d esp�ces de vert�br�s en Nouvelle-Cal�donie et �valuation de leurs impacts.